Not sure if it's minbot, or the game in general, or what, but a lot of us seem to be having on-and-off join issues these days. For a little while, rebooting routers seemed to do the trick. Now I'm not able to join most of the time, though. If anyone's interested in trouble-shooting and/or spinning up another bot for testing purposes, that'd be great. I'm also happy to fund a bot longer-term if that turns out to be useful - I got some funds, but no tech skillz. AMEN (/AMIN)! Min and I -- OK, OK, Min -- figured it out (and I just threw crap at a wall like a deranged monkey), but the point is: it's a DNS problem! So for now at least, that's the solution! I changed his ip address today, and updated the dns. So you will need to use 71.19.155.163 instead for the ip address. Hopefully the problem will be solved soon. Too ways to do it - one is shown above. 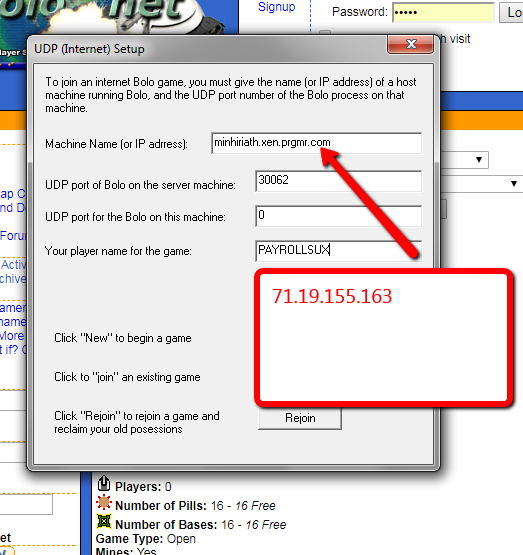 Or: winbolo://71.19.155.163:##### (replace #####s with game number) in your browser address bar.